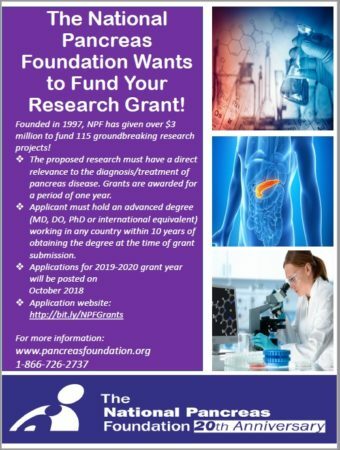 The National Pancreas Foundation (NPF) is a private, non-profit organization established to support the funding of research related to pancreatic diseases. It also provides support for the men, women, and children who are suffering from diseases of the pancreas. The proposed research must have a direct relevance to the diagnosis and/or treatment of pancreatitis, pancreatic cancer or other pancreas diseases. Grants are awarded for a period of one year. These and other grant requirements are detailed in the application. International applicants are able to apply but need to be affiliated with an institution engaged in health care related research. 2019 Research Grant submissions are due by January 31, 2019. Applicant Criteria: Applicants must be employed by an institution engaged in health-related research. Be a physician or hold an advanced degree (MD, DO, PhD or international equivalent) working in any country within 10 years of obtaining his/her medical degree at the time of grant submission. In cases of a change in institutions, while applying for, or utilizing funds from the NPF, applicants must notify the NPF, and will be subject to review based upon the change in circumstances. Collaborations with more senior scientists in an advisory or mentorship role during this project are viewed favorably during the review process. Research/Grant Criteria: The research must be in the field of pancreatic diseases. Studies intended to advance knowledge in the areas of pancreatic carcinoma, and all forms of pancreatitis would be the closest to the areas of interest of the NPF. Please submit the application via electronic file in Microsoft Word or Adobe PDF format to the grant application website HERE. We will only accept applications electronically please do not mail a paper copy to the NPF office. Notification The notification of the decision of the Board of Directors regarding funding will be emailed to the applicant and the Institutional Representative after the Board meets, usually in late April or early May.